Just five years ago you would have seen websites filled with flash videos, gradients, shadows, and different versions of the same website for desktops and for mobile devices. Sometimes there’d be a different portal for smart phones and another for feature phones. Things have changed and your site might be in for a website redesign. 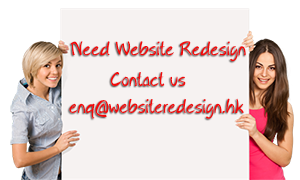 The new concept of today’s web designers is to keep one website for all devices. There’s just one portal for desktop computers, tablets, and phones. This means a website’s design should be compatible for all sizes and input methods. You can’t have a site that works great on a touch-screen device like an iPhone but doesn’t respond well to mouse clicks. This type of web redesign using “one-design for all devices” is called responsive website redesign. A page should be at its optimal viewing capacity whether it’s on a big monitor screen or on a 4-inch mobile phone. Modern websites are also going for a flat design. By saying goodbye to all the flashy media content websites look impressive on smaller screens but they also load quicker. This is important because people of today’s generation lose interest pretty quickly when a web page takes more than twenty seconds to load. Go ahead and visit the website of any leading media outlet like Times or The Huffington Post. You’ll see they are sticking with a very bare-to-the-bones design – white background, no colourful boxes or shades and gradients, and simple 3-column pages. This minimalistic design helps pages adapt to different screen sizes as well. Unfortunately there is still one obstacle that prevents complete website responsiveness and that is the fixed sizes for ads. There is a different board responsible for governing ad spaces and for the most part they still follow “extinct” web design principles that shouldn’t exist today. Here’s one big reason you should redesign your website with responsive tactics in mind: there are just too many screen sizes to cater for these days. Computer monitors range from 17 inches to 48 inches, Internet-ready TV screens goes beyond 72 inches, but phones and tablets stick in the realms of 4 inches, 10 inches, and others. Trying to make separate portals and designs for all of those sizes will drive any designer nuts. Redesigning your website to become responsive and more modern will streamline everything, making it easier for your designers and for your site visitors. It’ll clean up the unnecessary content and make your website adaptable for all devices. If your website isn’t responsive then it is time for a web redesign. It’ll be a good thing too: now more people on more devices will easily browse through your pages and the flat, minimalistic design will make your business look trendy and easy to navigate through.